Seeing as lots of people suddenly seem to be picking up on Twitter recently, I thought that maybe I should be adding my two pence worth to the conversation (obviously you can pick me up @acochrane). Why should I be talking about this sort of social media? Well I’ve talked a lot about Social Bookmarking in the past, particularly along the lines of Digg and Slashdot and this is just an extension of the theme that I’ve been going through. If ever you needed proof that something was becoming more important in society, it is the fact that the Guardian can’t work out if it should still be in their technology section or their media section. You write a short (140 characters or fewer) message called a tweet. People who ‘follow’ you see your message in their front page. People who you ‘follow’ get their messages appearing on your front page. Ok, fine, that’s not really it. There are a few different types of people in the world and this is where it comes in as a different use for different people. You are a person and you follow other people. These people are probably your friends, coworkers, etc. You probably know them. You’re interested in what type of sandwich they had for lunch. If they found a funny picture on the web (make sure you use tinyurls, or variations, because 140 characters isn’t a lot). That sort of thing. The people who follow you are probably interested in the same thing – share the ‘tweets’ from the people who you are following with those that are following you. Put your own ones up. It’s your call, your just there for a bit of fun anyway. This is where it gets a bit more interesting. You probably don’t know the people you are following in the sense that their your mates. They are almost certainly industry leaders. You’re there for their professional thoughts, help and advice. What do you want out of this – you want to share industry insights, useful blogs, help and advice. And you want them to do the same with you, if you’re stuck at work, you can ask the question to the audience and then they’ll respond. You’ve found a good blog and you post a link so that everyone else can read it. Someone you follow has posted a link, so you see what they are reading. Someone you follow asks a question and you answer them with your help and advice. How do you measure this? Well down the right hand side there is a nice little @replies that allows you to see all the people who have replied to your message. Clever. If you can keep a count of these, then you can find out how often people have helped you. Not so easy to find out how many people you have helped though, which should also be a good metric. For your posts, don’t forget that your tinyurl keeps a track of how many people click on the links – you should keep a hold of this to make sure that the people who follow you are enjoying the same content you are. Make sure that you pick up anyone who does a ‘Retweet’ (a complete copy of your tweet, with ‘RT @yourname’ on the front). Personally I think it isn’t really about measurement in this case, you’re just using it to benefit yourself and your personal career. The other thing to remember here is the use of # tags. If you tweet with a #, followed by a word, then you can get the twitter search to follow you. Personally I have a couple of RSS feeds, one of people who tweet using #wa and one for people who tweet with #omniture, this way I can find out people who are tweeting about my subject, without actually following them. Search for the ones that your industry may be using (or you can pick them up from what the people who you are following are doing or you could start doing it yourself and see if people follow suit). Haha, this is the need to measure becomes much more important. How do you prove that all the time that you are spending on twitter is producing the money for the business you work in. This is where it has become tough. Again though, there are a variety of different types of things people do here. Brand management is one of the obvious ones. If you don’t get your brands twitter profile, someone else will. In fact, someone else might get a variation of it anyway. What you want to do here is to maintain your brand. This doesn’t work with all brands. Why not? Who wants to have a twitter mate called imperial leather who just goes on about what type of soap they are using (sorry for taking it out on imperial leather). But that doesn’t mean there isn’t scope – you just need to create the niche (I’d come up with an idea here, but if I did, then I’d be doing that instead of this job). If you are looking at brand management, then really you want to be measuring how many people are following you and Retweeting you. If you can prove that enough people (and that number increases with the more time you spend) are following you, there is a legitimate claim that stopping doing this would have a detrimental effect on your brand. If you are doing it to make you more money directly (increase in visit, etc) then you need to be careful. Nobody likes spam. More importantly most of the people following you will already know about your brand and will therefore this is just a different way of providing them with an RSS feed. Most importantly though – don’t go from being a brand person to being a series of links to your site. People will get annoyed and all the good work you did on your brand will be undone. In these cases, you really want to look at how much traffic you are generating and how many people are buying (if applicable) or whatever your success criteria are. To do this, look in your Web Analytics referrer reports. Just as a word of note – your tweets are ‘nofollow’ so you’ll get no SEO benefit (but you could help fill up your search space – see BBC Sport‘s twitter being in the top 5 for Googling their brand). In reality, you probably end up doing a bit of a combination of the two, especially if you are a media site. Work out what the best options are by doing it for a while and seeing who responds the best. Usually you want to just be a bit more personal here though. Probably the least utilised area so far. This follows the same principles as your professional to professional. You want other businesses to help you and talk about what they are doing (ditto the other way around). In our boom times this was seen as something that you shouldn’t do because it would help your competitors. In the time of recession, it probably is too. But in some areas there will be a case where you just can’t take all the business (especially in the service sector) and you want to pass on business to other people by giving them best practice. I think there are lots of situations where this would be useful (I won’t list them all) in the B2B world. Maybe one of the big B2B magazines from my previous employer will write about it to encourage their readers to get in on the act. We in the Web Analytics professional world do it because there aren’t enough of us and we want to promote Web Analytics. I’m sure this is the case in many businesses too. 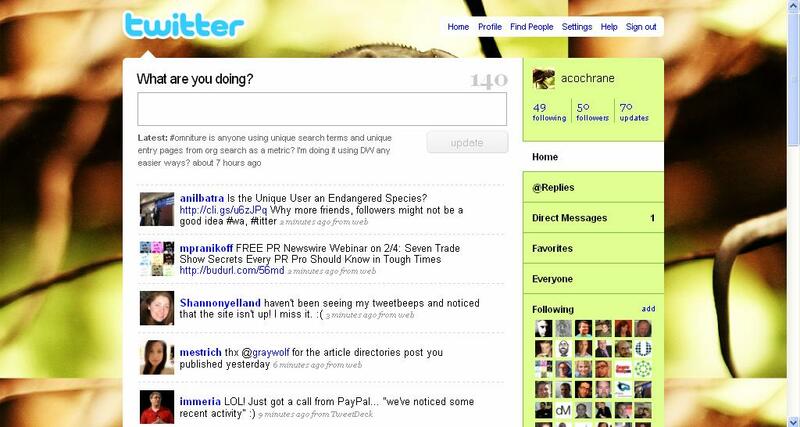 What it the best twitter manager tool out there today? I am looking for one that actually provides the analytics for me in a report that I can pull. Something that give DMs, @Replies, Brand Mentions and Followers on a daily , monthly, yearly basis. Also looking for someway to find out if the people I am following have been inactive for a long time so I can (maybe) unfollow. Any advice? 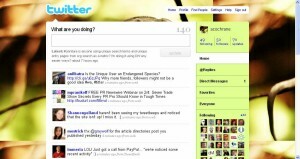 You might want to have a look at Twitalyzer. It gives you some decent stats on your influence, quotability, etc. You could also have a look at Ben Gaines excellent post on the Omniture blog, if you happen to use Omniture. As for unfollowing inactive people, I’m afraid I can’t help you. It is a very interesting question though – most people claim that they ‘unfollow’ people because they tweet too much or things that aren’t relevant, rather than because they don’t tweet at all. If they don’t tweet at all, then there is no harm following them as you’ll just not see any of their tweets appearing. If you do find something, let me know.